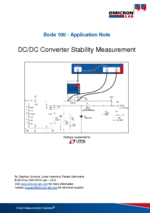 This application note explains how to analyze the control loop stability of DC/DC converters by measuring the loop gain. Electronic devices become smaller and smaller. Multiple supply voltage levels need to be maintained at very high converter efficiencies with fast recovery speed. Switching frequency tends to increase to make things smaller but also addy complexity to system models and design. In order to ensure the stability of voltage regulators and switched mode power supplies the control loop behavior needs to be characterized not only in simulation but also in real life measurements. The Bode 100 can easily be used to measure gain margin and phase margin of electronic control loops in a frequency range from 1 Hz to 50 MHz. Knowing your system gain margin and phase margin gives you the certainty that your system will be stable even under changed circumstances. Download the following document if you want to learn more about the basics of the voltage injection method as it was first presented by R.D. Middlebrook in 1975. In this video, Florian explains how to measure the stability of a feedback loop in a power supply using the Bode 100.